Our foreign policy was crafted and implemented by diplomats under the guidance of the Head of State or Government for a long time after independence. Though the radical Left was vocal on foreign affairs as on other subjects the majority of the population kept aloof from engaging in any public debate on foreign policy. Today the situation is quite different. In a welcome development foreign policy has become the topic of public discourse. However, it has its own negative consequences such as politicians of all ranks and statures who have become foreign policy experts overnight misleading the public. In this milieu, even some diplomats have abandoned traditional diplomacy concerned with less talk and more behind the scene negotiations and embraced what is called megaphone diplomacy to curry favour with the political authorities. Hence it would be appropriate to look at how our foreign policy is or should be crafted and what its salient features are. Foreign policy is none other than an extension of the national policy. The Yahapalana Government refrained from unequivocally condemning the attack on Muslims at Digana and Ampara a few months ago and blaming the Sinhala Buddhist fundamental groups such as the Bodu Bala Sena. The same vacillation was evidenced in the instance of the attacks on Rohingya Muslims by Buddhist mobs in Myanmar showing a corresponding behaviour of the Government. Also, a lacuna in our foreign policy could be explained by a lacuna in national policy among others. For example, if there are shortcomings or unclear issues in our trade policy as in the case of FTAs etc., it would affect foreign policy through foreign trade problems. There are no Robinson Crusoes or solitary individuals in society. Man is essentially a social animal. Similarly, there cannot be any solitary countries in the world. Every country is compelled to exist in a network of international relations. For its own sustenance, it must take part in the international division of labour. To be successful national and foreign policies should not be contradictory. Historical development has reached a stage where certain aspects of social life as human rights have become universal and the state of such rights in a particular country today is also a concern of other countries. This factor has to be considered in shaping the national and foreign policies of modern States. Human solidarity has become a potent force for social change as evidenced by numerous instances such as the Vietnamese struggle for independence and the struggle against apartheid in South Africa. Today in a situation in which Sri Lanka’s balance of payments is unfavourable remittances from expatriates in the Middle East is a blessing that reduces the burden. Hence it would be prudent to maintain our relations with that region at an optimum level. But are we doing so? On the other hand, it is acknowledged that our principal trade relations are with Western powers that exert various pressures to influence our foreign policy. We would not be able to successfully meet this challenge unless we diversify foreign markets for our goods. This should be one of the priorities in our foreign policy. Is it so? As evidenced from above external factors, especially geopolitics, affects our foreign policy. Special attention has to be paid so as not to be swayed by pressures from powerful States and maintain our independence. We are a small country strategically placed between two powerful States – India and China. Needless to say, that both of them will reach superpower status in the decades ahead. US Imperialism has already mapped out and is carrying out a strategy of forming a strategic alliance of the United States, India, Israel, Japan and Australia to counter the growing influence of China. It is also wooing other countries including Sri Lanka and Vietnam to this alliance. 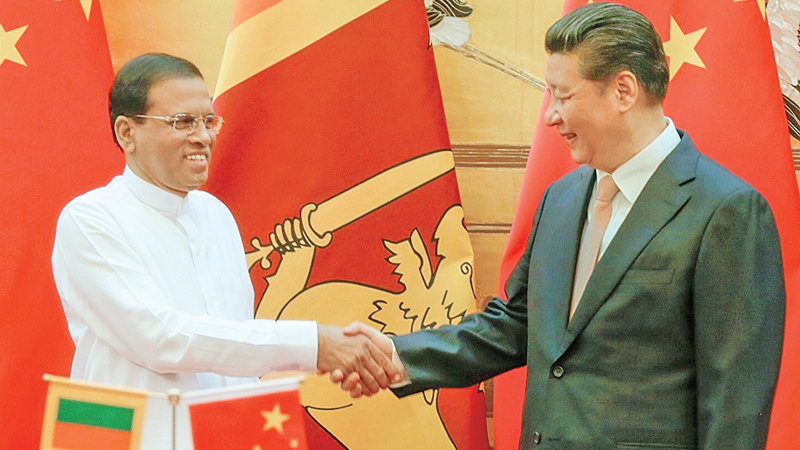 Sri Lanka has very good relations with both India and China since historical times. In fact the bulk of economic assistance we get come from them. Hence it would not be prudent to join such an alliance. Hence a strategy should be crafted to be equidistant from such rival powers while maintaining our cordial relations with both. This is easily said than done. The best course of action could be a move to form a tripartite economic and political cooperation among Sri Lanka, China and Sri Lanka akin to that between China, Japan and South Korea. It would also be prudent for Sri Lanka to join the Shanghai Cooperation Council (SCO) as a full member. India and China are full members while Sri Lanka is at present only a dialogue partner. Similarly, it should join the Asia-Pacific Economic Cooperation (APEC). Taking an active role in these bodies would reduce the chances of being dragged to rivalries between power blocs. US interest in Sri Lanka has grown substantially since this Government assumed office. Peace Corps which was sent packing from Sri Lanka earlier on allegations of interference in internal affairs is coming back. Uncle Sam has been generous enough to grant the US $ 39 m military aid. Though far away, the US is considering the Indo-Pacific area as its backyard and theatre of command. At present, Sri Lankan foreign policy seems to be with wavering on certain issues. For example, Sri Lanka has been a staunch supporter of the Palestinian people’s struggle for a homeland. However, it abstained from voting on a resolution supporting Palestine at the UNESCO. Also, our interest in the Non-Aligned Movement seems to have waned with the improvement of relations with the United States. Sri Lanka being a leading member of the movement should take the initiative to revive it for its objectives are still valid. Though the former East-West power blocs do not exist, new rivalries and power blocs are emerging and threatening regional and world peace. The threat of nuclear war has not receded. We should not blame other countries for pursuing their national interests through their foreign policies. It is to be expected. Our foreign policy should be based on our national interests. But are we sure what our national interests are?